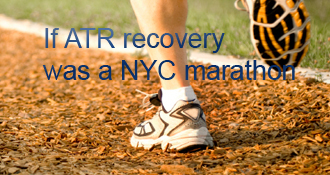 ultijo has completed the grueling 26.2 ATR miles to full recovery! I’ve been reading along and have finally decided to share my journey so far. I tore my Achilles playing ultimate frisbee. I fall into the weekend warrior category in which I hadn’t played in awhile and my Achilles popped when I has making a hard cut. I fell hard to the ground not knowing what had happened and thought the girl defending me had cleated me. I got it checked out the next day and my tear was diagnosed with a Thompson test. Two days later I had surgery for a complete tear. I was in a splint with a tensor bandage for the first two weeks followed by a cast after getting my stitches out. Overall pain has been minimal thankfully and aside from some ibuprofen the first few days I haven’t had too many issues. I took a week off work and kept my foot elevated on 2 pillows above my heart the best I could. At night I slept with my foot propped up on two pillows as well. Keeping elevation above the heart was key in limiting the amount of swelling that I had. I went back to work with the help of a knee scooter after a week. I also purchased the watertight seal tight freedom cast and bandage protector that was recommended by Dennis. Both the knee scooter and shower protector have been huge helps! I had my 4 week post-op appointment yesterday and was happily put in a boot! They checked to see that my foot could go to 90 degrees and in the boot I went. I’m cleared to start PWB and can start some plantar and dorsiflexion ROM. My foot was uncomfortable the first 24hrs in the boot but its getting better. I don’t have a followup appointment for another 4 weeks. I’m hoping that I can start PT then but ortho may need some convincing. The most frustrating thing throughout this process (aside from not being able to walk and being dependent) is that there is very little direction given to follow. I understand that everyone will heal and progress at different rates but I wish I was given more specific directions. I have done more reading about Achilles tendon repair than I ever imagined I would! The first couple weeks were also challenging in accepting that you need to be dependent on people for help do almost everything. My husband has been so patient and helpful over this past month. The knee scooter has also really helped with mobility but it was still a challenge to sit with my foot down without the constant throbbing. That has gone away by the 4th week for me. I would love to hear any suggestions for how to start with toe touching and slowly ease into PWB. Thanks in advance for your comments and will update again soon! Thank you both for your comments and suggestions. Your blogs have also been very helpful with learning what to except along the way. I’ve started to do daily ROM stretches and and getting used to the idea of putting weight on my foot. Hopefully I can start the couch and counter shuffle soon. I am going to try hard to get PT started at my next check up at 8 weeks. I should add: I didn’t start PWB until around week 7 or so, so my timeline is likely to be different with the move from PWB to FWB in the boot. I imagine it would have felt a lot weirder had I started at that point. Welcome to the club! It’s an exclusive one, at least. Regarding PWB - I found it helpful to sit normally in a chair and slowly get used to shifting weight back and forth (wearing the boot), almost like taking little steps to get used to the pressure on your foot/heel. At first just doing that was hard because I was so used to extending my leg and turning the foot outward to take pressure off of my Achilles. Then, when that felt better, I started “stepping through” with most of my weight on crutches, but some on my boot leg…simulating a normal stride as much as I could. Somewhere around that same time I started practicing standing weight shifts while holding on to the couch or a counter. Then I shuffled along the couch/counter. Then I worked up the nerve to take short steps in the boot. All told it was about 7-10 days from when I was cleared to PWB to when I was walking in the boot anywhere near normally. Like you’ll read a lot on here, your body will tell you how quickly to proceed. ultijo’s AchillesBlog is proudly powered by WordPress and WPDesigner..